CA-Intermediate Exams are far off, you may be thinking. But do not get carried away by such illusions. 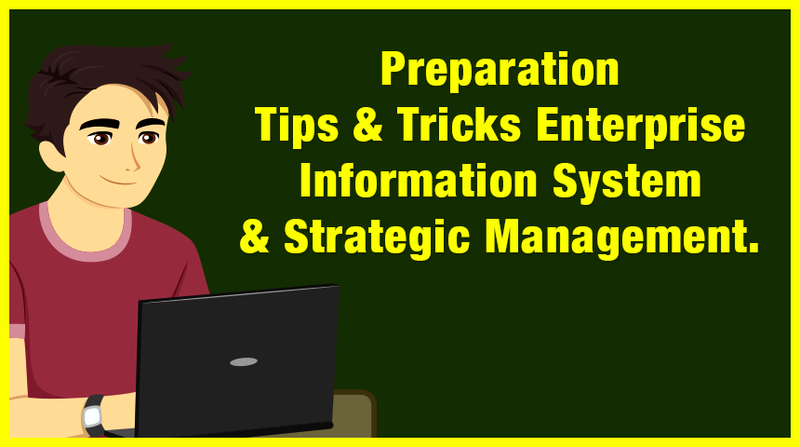 The syllabus for CA-Intermediate Paper 7- Enterprise Information System & Strategic Management is nothing short of vast. And you never know when time runs out too swiftly for you notice. Also, CA- Intermediate is a comparatively newer exam, introduced by ICAI under the revised scheme. Needless to say, there are more speculations about the exam than specified information. And rumors have it that CA-Intermediate is a more difficult to crack than CA-IPCC, its former counterpart. So, to make sure you clear exam smoothly in the upcoming attempt, start studying now. Not to instil fear in you or anything, but most students fail to score passing marks in Enterprise Information System & Strategic Management. Read on to find out why, and what you can do differently to score good marks in CA-Inter Paper-7. i. To develop understanding of technology enabled information system and their impact on enterprise-wide processes, risks and controls. ii. To develop understanding of Strategic management concepts and techniques and acquire the ability to apply the same in business situations. Business process, its automation and implementation. Preparing Flow Charts, Data flow Diagram. Flow and relationship of internal and automated controls. Grasp the understanding on the structure and flow of business processes, related risks and controls. Chapter 2: Financial and Accounting Systems. Working of financial and accounting systems. Reporting system, data analytics, business intelligence and fundamentals of XRBL. Application system, operating system, Data system, Networking and communication systems. Types of threats and their mitigating controls to minimize the impact. Types of controls and audit aspects of various system. Chapter 4: E-Commerce, M-Commerce and Emerging Technologies. Meaning, components and architecture of E- commerce. Laws and guidance governing E- commerce. Computing technologies likes Cloud Computing, Grid Computing, Mobile Computing, Green Computing and BYOD etc. Chapter 5: Core Banking System. Impact of related risks and control. Functioning of Core module of banking and business process flow. Regulatory and compliance requirements applicable to CBS such as Banking Regulation Act, RBI Regulations, Prevention of Money laundering Act and Information Technology Act. Strategy at different level of organization. Importance of strategic management in government and not- for-profit organizations. Chapter2: Dynamics of Competitive Strategy. Importance of strategic analysis that are used in business organization. Core competence & competitive advantage. Methods used in portfolio Analysis. Strategic planning, strategic decision making, strategic intent and vision. Different stages of strategic management process. Chapter 4: Corporate Level Strategy. Directional/grand strategies, stability strategy, expansion/growth strategy, combination strategies and strategic alliances. Chapter 5: Business level strategies. Features of Business level strategy, cost leadership strategy, differentiation strategy and focus strategy. Chapter 6: Functional level strategies. Functional areas of business requiring strategic decision. Features of marketing, financial, production. R& D and human resource strategies. Importance of supply chain management. Strategic role of human resource management. Chapter 7: Organization Strategic Leadership. Importance of organizational structure in strategy implementation. Relationship between strategy and structure. Concepts of supportive corporate culture, entrepreneurship and intra-preneurship. Role of leadership in execution of strategy. Chapter 8: Strategy Implementation and Control. Business Process Re-engineering and Benchmarking. How to Score good marks in CA-Inter Paper- 7 Enterprise Information System & Strategic Management? Scoring well in any paper in CA-Intermediate depends on hard work and a strategic approach. When it comes to Enterprise Information System & Strategic Management, students make some mistakes that cost them dearly. Let’s take a look at the common mistakes that students are prone to making, and which keeps them from doing well in this paper. They fail to realize that Enterprise Information System (EIS) is difficult to learn and retain. Start early – Start early and finish 30 percent of your syllabus before 90 percent students start preparing. Even during IPCC, the old version of CA Intermediate students used to find this paper difficult to crack. The reason being, the scope of this subject is different from commerce subjects. It is technical and has quite a vast syllabus. So, if you start early it will give you enough time to revise later. Start with strategic management – Out of the two sections, strategic management is considered to be more scoring. It is always advisable to start with this section and finish syllabus as soon as possible. That way you will have more time in hand to allocate to EIS, which is comparatively more difficult to learn and retain. Make Notes As You Go – While studying this paper, it is important to make your own notes. Make note of key pointers for each chapters and make a habit of learning them weekly. This will help you at the time of examination as revising both EIS and strategic management in a single day is not easy. Revise the important topics at least 3 times – Revise more if possible. It is crucial to do repeated rounds of revision for this subject as there is too much to remember, and it is easy to get confused. While revising, refer to your notes and practice manuals. Don’t start re-reading from the study material all over again. Attempt at least one mock test – Mock tests are the best way to check preparedness for the exam. In any case, it is better to make mistakes before the real exam and rectify them while there’s still time. Do not start with new topics too close to the exam – This is where we come back to the first preparation tip. Start early, complete as much as possible and revise what you know. But don’t start with absolutely untouched topics just a few days before the exam. For papers like Enterprise Information System & Strategic Management, presentation skills are a must while writing answers. In EIS it is important to label diagrams and flowcharts correctly. While writing answers for Strategic Management, try to give answer with examples of real business aspects. That will help you to gain more marks and create a good impression on the examiner. Your answer should be precise and to the point. Getting blank in this subject is a common thing. But when you will start writing, words will automatically flow. So keep calm while writing paper. Try to appear such question in which you have complete knowledge. Wherever possible, student should try to include relevant diagrams, tables, flowcharts etc. Read questions carefully, thoroughly, properly. First understand what is being asked of you and then jump to write answers. Follow the preparation tips and tricks in this blog post, and keep coming back to revisit the pointers from time to time. We are sure you will score well in CA-Inter Paper-7 Enterprise Information System & Strategic Management. In case of queries, feel free to call our experts @ 1800-212-7858 or comment below.